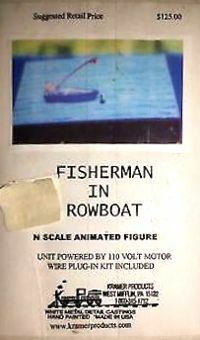 Kramer Products is/was a small company in western Pennsylvania that produces unique figures and animated toys, mostly with a sports theme. The figures are painted cast metal. The company appears to be out of business, as their website is gone. 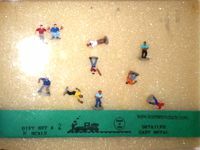 So far I've found three items: two N Scale baseball "gift sets" and an animated fisherman. 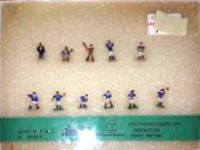 The products are not cheap; the baseball sets are around $60 each, and the fisherman is $125. There could be any number of these products floating around out there. Images are thumbnails scrounged from Google searches. I believe the likelihood of finding any of their N Scale items is very close to zero.